It has crossed my mind to sell baby quilts. I love making them and I'm starting realize there is not that many babies in my life. What is a quilt making lady to do? I've never sat down and formulated a business plan, set a price structure or an opened an etsy shop. Nothing as organized and official as all of that. It's more of a what if game I play inside my head. This is the kind of game that keeps me awake at night. Not all nights, but some. 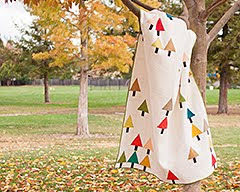 Yesterday in my google reader, a blog post popped up by some of my favorite fabric artists, Ink & Spindle. It was all about pricing your wares. They explained a pricing formula taking into account, cost of goods, artist's time, wholesale prices, retail prices. It all sounded very structured and well thought out. I found myself nodding. It made a lot of sense. I think the missing part of the equation is what is your target customer willing to pay? Some food for thought that's for sure! NOTE TO SELF: I have that book. Time to reread it! Sheesh. I wouldn't mind making some money on baby quilts either, but when it comes down to it - I don't see how people truly make any money doing it. If you search on etsy - you can find baby quilts for sale as low as $80- I don't even know how they cover the cost of materials. I think some people just take a loss and are happy to not have quilts piling up in their house so much. I'm struck by the same thing as Laurie. So many people sell quilts on etsy just to recoup the cost of materials. Honestly, it upsets me to think about it. I find it tremendously disrespectful to fellow quilters and to the art, craft, and history of quilting. Those people aren't just saying their own time and effort aren't worth anything, they're saying my time and effort are also worthless. Your article explains why a lot of people just don't do it for the money. There is no money in it. I make things other than quilts such as bags. I have figured out that I do much better if I tell the person the amounts and types of materials I need, then just have them pay for my time. It doesn't seem like I charge a lot to them, but they've already bought all my supplies! My friends seem to frustrate me most because they seem to have this underlying feeling that I should give them some big discount; usually a discount where I don't make any money! I'm just very particular about any type of commission job I take. This week I delivered a baby quilt to be auctioned at a charity event. I enjoyed making it and hoped it would be helpful to the cancer victim's family. I was heartbroken when the lady volunteering asked about how much it should sell for, suggesting $20! What??? $20 would nowhere near cover the cost of supplies, not to mention the 10+ hours of my time. My husband reminded me that quilting and sewing is not a popular hobby in general, and she was just ignorant. I agree, it would be very difficult to sell a quilt for it's true value in the given market. So, I find satisfaction in quilting for babies of friends and families, and hope I don't go broke doing it. Oh, my $20?!! I was considering donating one of my quilts to a nonprofit organization for an auction just to get my name out there and drum up some business. Now, I'm not so sure. I think a lot of people don't put a value on the time they spend making something - or they grossly undervalue it. $600 probably is right if one really does pay themselves an hourly wage. The target customer wants to pay as little as possible for whatever they're buying. I thought about selling quilts, Lord knows I love making them. I even opened up an Etsy account. I have never put any quilts on the etsy shop because I cannot bear to part with something I have spent so much time on. It seems some are selling their quilts for under $100 I just cannot fathom how they are even breaking even on materials let along the time involved. For now I will just make them as a hobby for gifts for friends and family. Fortunately I make quilts for a quilt ministry - we give them away, so we don't have to worry about pricing them. But back when I made children's clothes, I priced them double the cost of the retail full price of the materials, regardless of what I paid for the materials. That way if someone wanted a duplicate or something similar, they weren't shocked by the cost being higher. I did find that I sold my products at those prices - unlike some other sellers who priced their things at what they considered to be a reasonable price. Better to have the sale than to have a big pile of unsold stock! Long and short, if you love to quilt, run out of people to give quilts to, and want to sell them, make beautiful quilts, price them reasonably, and make more out of the profits! It's always very difficult to accept that people have to pay a job at fair value, the cost of materials and time spent are worth more now, you just make money very quickly. When we made ​​the patchwork it is unfortunately impossible to sell our work at cost, the public is not willing to pay large sums even knowing that the quality will be at the appointment, the financial crisis does not help things. I totally understand your questions and your doubts, I wanted to work for a magazine patchwork but given the prices of copyright, it's not interesting for me to do so. (another thing here... i buy the best ingredients possible for my pizzas... but i dont buy "designer" brands for it... it doesn't make good business sense. I cant afford to pay 9 dollars for something with the exact same ingredients in it as a 5 dollar something just because the name on the can) Looking at some of the quilts on etsy at lower prices... they dont buy designer brands either and their cost to make it is lower. I have been looking at etsy stores and i think the key is finding the balance. You might have a lower rate of return on the quilts, but totes and bunting the rate of return would be higher. All those combined together would make enough money to pay the bills, and put some cash in your pocket! sorry im wordy but i have been doing my research and im disappointed too that there isn't any money in it! Okay... here's part of the problem with using that formula to price your quilts. First, Ink and Spindle are catering to a niche market. (Most people I know can't afford to pay $94/m for fabric.) Second, they are wanting to sell to both the wholesale and retail markets. Third, their craft, with the exception of the few pieces of clothing they sell, produces a finished product in a fraction of the time it takes to piece, baste, quilt and bind a quilt. Hence the two processes are not comparable in that regard. Home quilters could not personally piece and quilt enough quilts to sell to wholesalers. 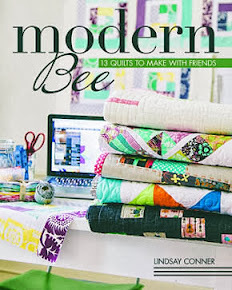 In other words, for most crafters and quilters, there is no middle man to think about. In addition... most quilters/crafters work from their home. Their overhead is comparably much lower. In fact, even to claim expenses such as rent, electricity, etc on taxes you would have to have a space/room specifically dedicated to sewing or whatever craft you are selling. I'm not saying that quilters and crafters should not price their products to receive fair compensation. What I'm saying is that different types of businesses need to use different formulas to price their products. And the formula that works for one business doesn't necessarily work for another business. i agree that you have to price according to what your customer will pay. on etsy, if you have a product priced too high, no one will buy it. it's better to lower the price a little bit to sell the item. although, i do see lots of people selling their goods for practically nothing too! I hear you. I always laugh when I give a baby quilt at a shower. Inevitably someone in the group tells me I should sell them and wants to push the issue. They just don't understand the value behind the item and the fact that others are selling at below value. Not to mention that some people are just buying "printed quilts" from places like Target. I'm happy with gifting and doing commissions for people I know. Great post! 600 IS a lot for a baby quilt, it's so crazy! I'm off to read that article, thanks! I've heard the point before "you don't get rich selling your quilts" and I agree with everything everyone above says. I've toyed with the idea of selling my handmade wares too, but I think for me it would come down to whether I'm selling them as a hobby (so I can buy more fabric and make more stuff after everyone I know is tired of quilts and bags and hats and scarves) or if I'm trying to make a living. If I'm trying to make a living, I'm probably going to go hungry, hahaha! But if it's just for fun, then I may do it. I like the idea of selling other items that have a higher profit margin (pouches, bags, hats etc.) in order to be able to sell the larger items (quilts) at cost - balance it out. But then I also agree with Dan's point that if you sell for less than its true worth, people think that's what it's really worth and won't pay more for other similar items. You're setting the expectation. It's a tough issue and I wish you well in making your decision. I agree. The demand side of the economic equation is as important as the supply side. If the price you need to charge to make money is a price that no one is prepared to pay, then you do not have a viable business model. Most crafts do not provide a viable business model. If you want to sell things you've made at less than their full economic value because you've had the pleasure of making them and would like to recoup the costs of the materials to be able to keep making more, that's fine. It's not a business, but it can be a self-sustaining hobby. Personally I can't put a value on the joy I derive from all aspects of quilting. If that means I never recoup any money for the time I spend making something then so be it. In many ways I've already received payment, just not in the monetary sense. I'm sorry to hear that people thinks this devalues all quilters, and I struggle to see how this is the case. For every person willing to spend $20 on a quilt, there will be another will to pay $200+, and surely it's the same with everything from food and clothes to art? I think their formula is misguided and very narrow minded. They're assuming that ALL sellers need at least 50% mark up on the cost value. Let me tell you, a 50% profit margin is HIGH, a 100% profit margin (what they suggest charging for retail) is super high. Most retail businesses operate at around 30% profit margins, and that's considered a healthy profit. You can't just times everything by two, business isn't that straight forward, you have to take into account what your market is expecting to pay for an item too. There are also more costs associated with creating and selling than time and materials, what about electricity to power your tools, space and the heating and lighting in that space, taxes, etsy fee's. Their formula sure looks pretty but is not good advice by any standards. Also, I think another missing piece is "what would I be willing to pay for a quilt?" I know the cost of materials, I know the time it takes to make a quilt. I know all that and yet I do not think quilts are worth as much as the formula would have you believe. How can I exect someone to pay a price that even I wouldn't pay? 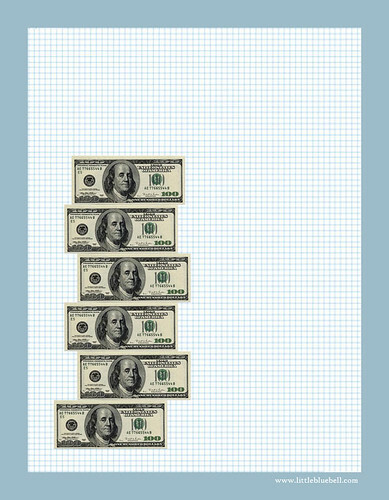 I love the graphic you included in this post - very clever quilt of stacked bills! I recently did a commission quilt for a soon-to-be-born baby. It was for strangers that found me through a friend. I met with them, we talked about their vision for the quilt (which was very precise). I estimated the fabric costs and requested that they pay for the fabric up front. I then drafted out the quilt and based on my 10 years experience figured out how long it would take me. I determined an hourly cost I was happy to work for and the customers approved the estimate. 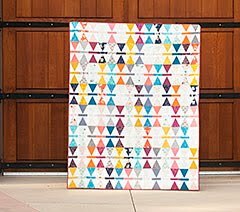 I made them a 40" x 48" baby quilt for $300 and we were all happy. In fact, they were ecstatic to have a unique family heirloom at that price. I understand the need for the 'formula' for a livelihood business. It doesn't really apply for me, sewing out of my home with no staff to pay. I won't work for less than a certain hourly rate though, because my time & skills have worth! I have done commission quilts as well, and I follow Poppyprint's example, exactly. Always get a deposit or cost of materials up front, then if they can't come up for money for finished product you really are only out your time but still have a quilt that can be gifted or sold to someone else or given to charity. I think selling quilts or handmades on a (craft-specific) site such as etsy, at a price point that ONLY recoups your cost (i.e. the $75 baby quilt), does devalue quilters and quilting in general, because the only elements of comparision available to the shopper are price and size. Quality of materials, etc, never comes into play, as it would face-to-face or with direct customer interaction. After reading the article and all the comments, I agree that there has to be a difference between building a business and sustaining a hobby. 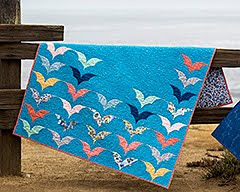 I hope to start selling my quilts at a reasonable price (say, $250 for a lap quilt) once I become a good enough quilter. The goal here is not to support myself, but to support my habit and keep the clutter down. Perhaps on etsy I could make that clear in the listing? Not sure what the right answer is, and don't want to devalue others, but somewhere practicality has to enter into the equation. A lot of people sell their quilts more as a turnover rather than a business. Sell a quilt to buy materials to make more. I love quiltmaking and I do sell some of my quilts on etsy and use the 1/3 method to calculate the price. Whatever the cost of materials to make the quilt multiply x 3 to get your sale value. I take into account that if I do want to make a sale, I need to be at a certain price point, and recognise that it is partly a hobby, partly a business. I do commissions and give a lot of quilts as gifts as well. Supermom pointed out the most important difference between Ink & Spindle's formula and our reality: It doesn't work for a heavily labor intensive product like quilting. I also think starting at a wage of $20 per hour is excessive for a home based business. 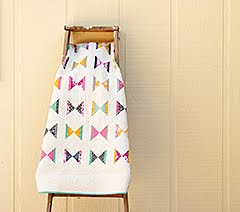 Using that formula, the twin size sampler quilt I'm working on now would need to be priced at more than $3,000! No one where I live would pay that - they wouldn't pay half that. I appreciate the idea of valuing hand crafted work, but the concept of Demand is also important. (Cost of time at minimum wage (that's $7.25 where I am) + cost of materials) x 2 = price. Increase or decrease based on the quality of the work and the demand for your product. Sounds pretty low, but with that formula the price is about $800 - and I'd still have trouble finding a buyer locally. I guess my friends and relatives who have received quilts from me as baby and wedding gifts would be surprised at the "value" of their quilts! One more thing - so many of the quilts sold on etsy (not all, certainly, but a majority) are relatively simple quilts, quickly pieced. Uneducated consumers tend to value quilts by their size rather than by their complexity, comparing a baby quilt to a baby quilt, a king quilt to a king quilt. The difference in the labor cost between the two quilts is vast - I could make a baby quilt in 5 hours or 25 hours, and many consumers wouldn't recognize the difference. They'd just see a price of $150 compared to $500 and assume the $500 one was overpriced. I just had the exact issue recently, when I donated a lap quilt for my son's school auction and they lept pressing me for a value. Well, let's start with $100 in fabric and batting. Conservatively estimating my time at 50 hours, and assigning a newbie value of about $10 an hour (I'm slow, but the quality is excellent), there's $500 more. Obviously I can't say $600, so what's the "value?" To me, there is no value. It just doesn't exist. So I give away my quilts. You should have said $600! If the quilt was appraised for insurance purposes, that's probably where the value would come in! I agree with most of the commenst above. I have noticed that most craft items produced by women are undervalued by the consumer. However, those produced by men (such as furniture, carvings and metal sculpture)are seen in a different light. Is time spent on the men's products more valuable than the time we spend on making a quilt or other fabric item? No, the difference is that men generally present themselves and their work with more confidence and authority, and we women apologize for ourselves, tell people we're really not that good, point out the flaws and shortcomings, and call it "just a hobby." I have only made a couple of quilts to 'sell'. I made them for a church fair and insisted on raffling them. Most people will pay £1 for a ticket but not £100 for a quilt in our area. Luckily I managed to raise £200. I think unless you get the right type of people who appreciate handmade products then you will have folks wanting to pay the lowest price possible. Good luck to all who sell their quilts. I disagree with everyone. Before you write me off as the lone crazy lady who doesn't know what she's talking about, let me tell you that I'm an interior designer, and I just got back from a meeting with clients who hired me to do a custom nursery. They approved a custom DIAPER STACKER that I designed and that my drapery workroom is going to sew, for a total cost to the client of $585. For a diaper stacker. This client showed me a throw that she purchased on her own for the nursery, to get my approval on whether it "works" or not, and I saw that the price tag still on this throw blanket was $200 but it was just two flat pieces of Minky, wrong sides together, with satin binding trim and a label from a swanky boutique. Hmmm... Was that even $20 worth of materials? It could definitely be cut and sewn in an hour, tops. Also keep in mind that, if you set yourself up as a business with a resale tax ID, your material costs will go down because you will be able to purchase a lot of your materials at wholesale rather than paying retail. So, how do you find these kinds of customers? Well, if you're serious about this, then I suggest you put together a sample collection of baby quilts in different styles (and I highly recommend you include options like organic fabrics, organic and/or bamboo batting, or the Hobbs Tuscany Silk or Hobbs Tuscany Wool battings, since these are all wonderful buzzwords for those selling in a luxury market). Show them to interior designers who do nurseries, take them to high-end baby boutiques in your area – with the understanding that the interior designer or boutique shop will need to add a markup to your price so they can make a profit. Find the local photographers who specialize in custom pregnancy and baby portraits, and see if you can cross-promote by leaving your business cards in their shop -- you could even offer to supply them with a baby quilt or two to use in their photo shoots. I think you could price custom baby quilts for this target market in the $600-1200 price range, depending on the complexity of the piecing design and the amount of quilting. You need to talk about your quilts not in terms of how many yards of fabric at $7/yd, but as family heirlooms that will be treasured and handed down to the next generation. You can talk about all the different ways the quilt can be used -- as a baby blanket, dragged around Linus-style, or for snuggling in the rocker during late-night feedings, or even as a wall hanging above the crib. You can offer to incorporate fabrics from family members, like the dress that Grandma made for the mommy-to-be when she was a little girl. Are you getting my vibe? This quilt is priceless! Here's the catch: You need to connect with that upscale customer who is willing and eager to pay a premium for something that is one-of-a-kind, created just for them, that no one else will have. You need to have the technical skills to create a quilt that is to the highest quality standards for a customer who is paying that kind of money (no cutting off the points on your triangles, seams must match up precisely, quilting must look professional without excessive wobbles, thread tension issues, etc., binding must look good on the front and back sides, whether it's stitched by hand or by machine). And finally, most importantly of all, you need to confidently present yourself as a professional fiber artist who is willing to accept commissions on a case-by-case basis, when they are projects that appeal to you and when you are given enough time and creative license for the project to be fulfilling to you as an artist. There is no room for humility here; you can't apologize for yourself or talk about how you're "just doing this on the side" or anything like that. The customer needs to feel like they are lucky that you are willing to accept their project, because that adds to the perceived value of the finished quilt, too. The only downside to all of this is that, when you're making a quilt for a client who is paying you $800 or whatever, there's a much higher stress level. You will often find yourself spending hours on a quilt with a design that you don't really care for, in colors that you loathe, and as your business becomes more successful you will have less and less time to work on your own quilts -- you lose your hobby when you turn it into a business. Whether you decide to do it professionally or not, please don't sell yourself or your quilting short. In a mass-produced world where everyone drives the same cars, eats at the same chain stores, and wears the same clothes, anything that is handmade and unique is to be prized. Your quilts are worth SO much more than the cost of the fabric! I totally agree with Rebecca Grace. I make quilts for therapy. I don't' take commissions because of the pressure level. It then becomes a job. Been there, done that. I make mostly scrap quilts. If someone wants to buy one of my quilts, then I sell. I hope someone sees this and can get back to me ASAP. Two co-workers lost their baby this year, at only 19 days old! Last night, the mom asked me to turn some of his sleepers and receiving blankets into a quilt for her 6'7" fiance! I have made full size t-shirt quilts, both fully stabilized, and custom machine quilted. I definitely undercharged for the first one, but was paid $650 for the second one. Since baby sleepers are so tiny, there is going to be a lot of work involved in cutting them apart and stabilizing them, then I am tasked with coming up with a design... a lap quilt has been requested, but I am at a loss on pricing this one. Thinking in the $525 range, any thoughts??? I know this was awhile ago but I have to say I am appalled that you would charge grieving parents that much to preserve their precious child's memory! Imagine how much that quilt would mean to them and their family, you can't put a price on that. If it were me I would do it for NOTHING and thank God that he blessed me with a talent that could create something so priceless. Quilting is so special to me and I feel only those who love me will TRULY appreciate each and every stitch for lack of better terms stitched out of love. Don't get me wrong, I've sold baby quilts but I will only make simple ones to sell. I refuse to create a complicated beautiful quilt to sell because not many people will pay what it's worth. I'm not trying to be rude but give you another way to look at it. If they are still needing one made I'd gladly do it. And I'm sure they wouldn't care if it was a simple patchwork quilt. They don't need a fancy long arm quilted professional quilt and they probably wouldn't know the difference anyway. Appalled doesn’t even BEGIN to cut it, Nicole. “They don’t need a fancy longarm-quilted professional quilt”? Wow, Nicole, that is one of dumbest things I’ve ever heard a woman say on a quilting blog. The grieving parents “probably wouldn’t know the difference” between one of your half-assed patchworks & a beautifully designed professional memorial quilt? What kind of planet do you live in on that “God has blessed me with a talent” galaxy? I highly doubt that these parents would be pleased by your craftsmanship OR your condescension. I have made many memorial quilts for people of all ages and each one was priceless, whether it was a paid commission or a gift. Dollars are ephemeral but heirlooms are not. Each of these families deserved the best & that is what I gave them: MY best. My artistry never varies; I do not make crap for anyone, anytime, for any reason. But if you have had sorrowful parents see your post & cry “yes, I’d love to have you memorialize my child cheaply!” then I will stand corrected. Another offensive assertion that you managed to make in such few sentences is that quilters are obligated to share their talent without recompense. Maybe Picasso will come back to life & whip out a few free canvases for you, but until you storm the hospitals, grocers, funeral homes & clothing stores to demand that they provide all services free for ill children, then it is sexist to insist that women artists work pro bono in such circumstances. What if she were trying to put food on the table for her own children with such a commission? Think before you spew words, lady.